Everybody that I have told about my upcoming trip to Rome has asked me if I’m nervous, excited, or worried about travelling alone. They are all excited for me; they have all said that they will be thinking about me and that I should be careful while I’m gone. And all I’ve been able to say is that I’m super excited about it, that it’s going to be the adventure of a lifetime, and that of course I will be careful. I’ve got a good head on my shoulders, I’ll be fine meeting new people, and everything else that I can think to say to make them feel better. All the while I’m standing there thinking about how I should feel more excited, or how my nerves should be eating at me. Maybe I should be more stressed out, or maybe I should be more worried about travelling alone. But honestly it still doesn’t feel real. This trip of mine. I’ve known about it since October and it’s always been one of those trips in the future, at the back of my mind, sort of things that always has a surreal quality. But now it’s becoming reality, I really am hopping on a plane on Friday and flying across the world. And it’s starting to sink in. And damn am I getting excited! I’ve been assigned to play the second flute part for Haydn’s London Trio for two flutes and bassoon, a piece that will be played five or six times while I’m there. The repertoire that the symphony will be playing includes Mendelssohn’s Fourth Symphony, Debussy’s Afternoon of a Faun, two different Beethoven symphonies, and a handful of other pieces. There are dozens of different opera scenes and arias that we will be playing, including portions of La Traviata, Bizet’s Carmen, and Mozart’s Magic Flute. 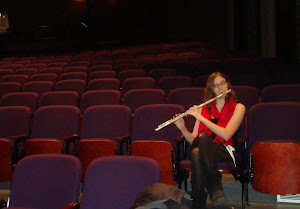 Although I won’t be playing for all of these performances, I was signed on as a section flute—which essentially means that I will be rotated in to different parts throughout the festival—I will be there for all of the performances. I’m excited about all the cultural expeditions that will be happening, and damn straight I’m going to go to all of them. Regardless of how late I was out the night before I will be up at 7 to go check out all that Rome has to offer. Even if it’s not considered the “cool” thing to do, many of my colleagues will be from Italy why would they want to bother going on these trips if that’s where they are from? Well I’m American, from a small town in Minnesota, and I will be immersing myself in every element of Roman culture that I possibly can while I’m gone. I keep joking about how maybe I’ll find a job and stay out there. Maybe I’ll find a professional opportunity, a paid gig, that I can’t turn down and I’ll become an expatriate. I’ve been considering applying for a Fulbright to study abroad in England after I finish my masters here in America to get a performers certificate from a European school. Although I feel burnt out now, tired of school, looking for a change, something new and exciting to do beyond music. I have a feeling that if I were to go abroad for my next level of schooling that cultural change alone my reignite my passion for music. But that seems like a big gamble. This is where the Rome Festival comes in, if I fall in love with the attitude abroad, with the musicians and maestro(a)’s, and the culture maybe I will stick it out there for a few more years to see where life takes me. Who knows, that seems to be the theme of this blog (and my life) lately. I’m starting my 23rd year of life with my biggest adventure yet, who knows what will happen in the next few years? And who wants to. Really. I’m just going to keep living my life and seeing where it takes me. It’s been working out pretty well so far.